Congressional Medal of Honor Foundation - Celebration of Freedom - DatocWitten Group - Strategic Event Planning and Fundraising. 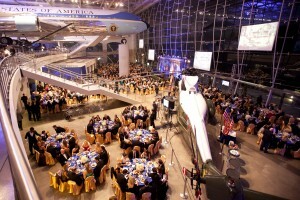 On February 26, 2011, more than half of the 85 living Medal of Honor recipients gathered at the Ronald Reagan Presidential Library in Simi Valley, California, with approximately 750 invited guests for the fourth annual Celebration of Freedom gala. Co-hosts for the evening were Mr. David McIntyre, President & CEO of TriWest Healthcare Alliance and a Foundation board member, actor, entertainer of U.S. troops and Emmy and Golden Globe Award winner, Mr. Gary Sinise and businessman and Foundation board member, Mr. Bruce Brereton. In addition to a tribute to America’s Medal of Honor recipients and the values they represent, the Congressional Medal of Honor Society and Foundation honored several deserving Americans that have had a profound impact on our country, including Jack H. Brown, navy combat veteran, noted philanthropist and CEO of Stater Brothers; former Secretary of State The Honorable George P. Shultz; and entertainers Connie Stevens and Ann-Margret. DatocWitten Group, Inc. produced the 2010 Celebration of Freedom, and the 2012 Celebration Freedom which honored The Honorable Robert Gates, former Secretary of Defense; ADM Michael Mullen, USN (Ret), former Chairman of the Joint Chiefs of Staff, and Mrs. Deborah Mullen; and actor Joe Mantegna. DatocWitten Group, Inc. provided comprehensive event design and management for the gala and related activities including a hospitality suite, private tours and welcome dinner, invitation and list management, seating services with complex protocol requirements and on site event management services.